Peltor Kid ear muffs offer high quality features and a moderate price that makes them the best selling ear muffs that will properly fit babies and young children. Rated at NRR 22, Peltor Kid ear muffs offer protection in noisy situations up to 107dB of continuous noise! This level of sound reduction will let your baby sleep comfortably through concerts, fireworks displays, church music services and many other loud venues. For those times when the noise gets dangerously loud at an event, Peltor Kid ear muffs let you have peace of mind that your child's hearing is protected (we hope you don't forget to protect your own hearing as well!) Finally, you can regain the freedom to take your child with you to the noisy events you love. Peltor Kid ear muffs are fully adjustable to fit babies well under a year old, up to smaller adults, and the adjustments stay adjusted! Unlike some cheaper ear muffs in which the slide adjustments are loose and do not retain the position you put them in, Peltor Kid ear muffs stay right where you set them, keeping the headband from pressing on the top of the head. Of particular importance, the clamping force of the Peltor Kid ear muffs strikes just the right balance between tight enough to provide the seal needed for adequate noise protection, and too tight for comfort. Peltor Kid ear muffs provide a nice snug fit that is just right for your child's tender head. 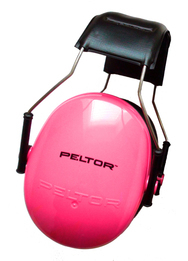 Peltor Kid ear muffs are available in pink. Peltor Kid ear seals are the right size for young children and babies. The ear seals, made of urethane foam damped with mineral oil and covered in a soft, smooth vinyl, gently form a perfect seal against your child's head. Light Weight -- At just 8 ounces, Peltor Kid Ear Muffs are comfortable enough for the little guys. Peltor Kid Quality Headband Style Ear Muffs (Pink Only) (NRR 22)5PraskaMay 25, 2016I live on a small acreage, wanted to protect the grandkids hearing around the mower and tractor they like to ride. The earmuffs work very well, the load noises don't bother them now. I sent a pair home with them to wear when they help their dad. Peltor Kid Quality Headband Style Ear Muffs (Pink Only) (NRR 22)5Q. AndersonAugust 4, 2015Love the ear protection so much that I have purchased A pair for myself, wife and my other daughters. Mine and the wife's are for shooting practice and the daughters is for well what ever they need them for. Again Thank you PELTOR, I can never thank you enough!!!! THANK YOU, THANK YOU, Could go on and on but I wont so THANK YOU PELTOR!!!!!! And THANK YOU EAR PLUG SUPER STORE!!!!!!!!!!!!!!! Peltor Kid Quality Headband Style Ear Muffs (Pink Only) (NRR 22)5Q. AndersonJuly 7, 2015Words will never be able to explain how happy your product made my wife and I. 2015 was the first time my little girl could enjoy the fireworks, (she has sensory disorder) It takes a lot, but I cry tears of joy! Liked them so much that I purchased 2 more kid and one adult, I would recommend PELTOR to everyone and do!! THANK YOU!!!!!!!!!!!!!!! No really THANK YOU!!! Peltor Kid Quality Headband Style Ear Muffs (Pink Only) (NRR 22)5MargaretOctober 28, 2014Bought 3 yrs ago for our son to help dad with the mowing. Just bought the pink ones for our daughter since she is now the little helper. Peltor Kid Quality Headband Style Ear Muffs (Pink Only) (NRR 22)5CoryJune 25, 2014Love them!! Bought a pair several years ago for oldest son then another when second son was born. Lost one of the pair so I was happy to see they are still around. Bought blue pair to replace lost pair. Work perfectly and fit great; great quality. My son is 6 1/2 and has a bigger head and they work great for him. Should be able to wear them for a few more years. Peltor Kid Quality Headband Style Ear Muffs (Pink Only) (NRR 22)5Stacey ZunnerApril 9, 2014My 9 year old autistic son absolutely loved this product. He has many sensory disorders & this has helped to alleviate some of this. He can now join in some activites that weren't possible before. Thank you for this ! Peltor Kid Quality Headband Style Ear Muffs (Pink Only) (NRR 22)4JulesDecember 19, 2013I ordered those Ear Muffs to myself so i'll be able to study while my boyfriend talks on the phone or watches T.V. since I'm very sensitive to noises. The muffs are really comfortable and pretty and they do a great job with muting background noises and making them a lot less annoying but I still could here him talking clearly if he wasn't far from me. Peltor Kid Quality Headband Style Ear Muffs (Pink Only) (NRR 22)5CHDecember 1, 2013We bought these for our 3 month old to wear during church and, with a little adjusting, they fit perfectly. Peltor Kid Quality Headband Style Ear Muffs (Pink Only) (NRR 22)5ErinOctober 1, 2013These are the ear muffs we needed! My son hated going to see any sporting events citing they were too loud for him. But now he wears the Peltor Ear Muffs and he can enjoy himself. (And I don't have to hold his ears for the entire time.) Great service! Thanks! Peltor Kid Quality Headband Style Ear Muffs (Pink Only) (NRR 22)5Mz LeilaniSeptember 18, 2013We took our 2 year old to a 3 day concert festival. They worked so good, she was able to take naps while bands played right infront of her! I recommend these to everyone! Peltor Kid Quality Headband Style Ear Muffs (Pink Only) (NRR 22)5Matt PJuly 10, 2013These seem to do the trick. My son who usually does not like these kinds of things on his head, is happy to wear it. I am looking forward to the race where we will actually use them. Peltor Kid Quality Headband Style Ear Muffs (Pink Only) (NRR 22)5AGTNJune 28, 2013My husband and I bought this product for my 1 1/2 year old daughter. She loves the pink color and actually brings them to us to put on her. They fit extremely well and I don't worry about her ears when she's wearing them. Thanks for such a great ear muffs! Peltor Kid Quality Headband Style Ear Muffs (Pink Only) (NRR 22)5tee415June 28, 2013We recently purchased a peltor nrr 22 for my preemie daughter for our up coming disney trip and we are more than satisfied with the purchase. Not only was it what we ordered but it came earlier than the expected delivery date. Cant wait to try them out. Peltor Kid Quality Headband Style Ear Muffs (Pink Only) (NRR 22)5SandiJune 20, 2013Bought this for our 3 month old son. He first wore it to a movie house and it was really good. Can't wait to use it again and again... It definitely opens up new possibilities. I was worried at first about how it might squeeze his fragile baby head but he wasn't bothered by it. Peltor Kid Quality Headband Style Ear Muffs (Pink Only) (NRR 22)5GavinMay 22, 2013I have a 6 year old that has had her 1st pair since she was 1 and now a 1 1/2 year old who has her first pair. These are great for the lawn mower when they want ride along. Peltor Kid Quality Headband Style Ear Muffs (Pink Only) (NRR 22)5Linda BrownMarch 20, 2013Got a blue set and a black set for 3-year-old twin boys. Couldn't believe how much they wore them. I bought them so when they ride with their Poppy, the sound of the riding mower does not hurt their ears. Will probably get two more sets for the other two grandchildren. So glad I got these--could have used them last year at the air show. Peltor Kid Quality Headband Style Ear Muffs (Pink Only) (NRR 22)5Denise ThompsonMarch 12, 2013My husband & I bought a set 2 years ago for my daughter so she could join us at her papas drag boat race weekends. Now we're buying another set for our son! These are perfect in every way and make managing family weekends without stress of the engines hurting my little ones ears so easy! Peltor Kid Quality Headband Style Ear Muffs (Pink Only) (NRR 22)5JamieMarch 5, 2013We purchased these for our 5 month old son for our travels overseas. We flew on military aircraft which are very noisy. With forethought, we had him wear them more and more everyday leading up to the trip. He wore them for 12 hrs straight without incident. The muffs easy adjust, could fit an adult sized head, and obviously fit a 5 month with no issue. Peltor Kid Quality Headband Style Ear Muffs (Pink Only) (NRR 22)5RuthFebruary 2, 2013My son can now enjoy group activities that were previously very painful for him! He managed an entire live hockey game and can manage live music now! I see our horizons broadening! Peltor Kid Quality Headband Style Ear Muffs (Pink Only) (NRR 22)5JanJanuary 20, 2013My daughter is 29 and has autism. We buy the adult white ear muffs and they work wonderfully to block noises she is sensitive to. She is still able to hear conversations without a problem. I wish they made the adult size in colors and had some without the writing on them. The kids sets are darling and it would be great to have them in the adult size. Peltor Kid Quality Headband Style Ear Muffs (Pink Only) (NRR 22)5JoleneNovember 28, 2012Our 2 yrs old son has had a pair since he was born and we just recently purchased 2 additional pair for our other 2 babies. We Love the product and would recommend them to anyone. Peltor Kid Quality Headband Style Ear Muffs (Pink Only) (NRR 22)5SusanOctober 1, 2012My son is 4.5 years old and is sometimes sensitive to loud noise (including music). We purchased these because we wanted to bring him to a concert and we wanted him to be able to enjoy himself. He immediately liked these ear muffs. They were comfortable and allowed him to get used to the environment on his terms. I would highly recommend this item to anyone who is considering purchasing ear muffs. Peltor Kid Quality Headband Style Ear Muffs (Pink Only) (NRR 22)5Keith WadleySeptember 25, 2012We use them for our daughter primarily who seems to think that everything is loud. Church, parades, at home when her brother is playing his guitar, etc... They are a great quality and the tote bags are a nice touch for keeping them clean and easily transported. Peltor Kid Quality Headband Style Ear Muffs (Pink Only) (NRR 22)5AmySeptember 9, 2012I used this item for my 6 month old daughter in the pit at a race track. The worked wonders and she looked adorable! Peltor Kid Quality Headband Style Ear Muffs (Pink Only) (NRR 22)5Susie H.August 26, 2012This is the second set we have purchased for our 7 y/o daughter. She has SPD and loud noises really hurt her ears. Highly recommend these. Shipping time was unbelievably quick. Peltor Kid Quality Headband Style Ear Muffs (Pink Only) (NRR 22)5Jen DalyAugust 24, 2012Thank you for offering an item to help my daughter deal with overstimulating sounds in her environment at a reasonable price. We purchased these to trial for our daughter with Autism. She will sometimes wear them in the car and is still getting used to wearing them in other situations. The cost gave us the ability to try it out without investing a fortune. I will recommend your website and products to other parents in the Autism community looking to purchase sound blockers. Peltor Kid Quality Headband Style Ear Muffs (Pink Only) (NRR 22)5Sarah JensonAugust 14, 2012We bought these for our son who was recently diagnosed with Sensory Processing Disorder. He loves the size, ability to adjust them to really fit his ears, and we love how well they actually work. He can still hear us talk, but he doesn't hear all of the other noises going on around him. They really help filter out the excess noises that would typically send our son into Sensory Overload. We took him to a MLB baseball game this weekend, and he had a great time while wearing his new "headphones". They were a blessing to have, and we couldnt be happier with the quality. Oh, they were shipped and to us faster than we expected too... great company, great product, great service... cant get better than that! Peltor Kid Quality Headband Style Ear Muffs (Pink Only) (NRR 22)5SusanJuly 23, 2012I bought these for my son who would be going with us to an Irish festival we were headed to that would have some rock music tents. He gladly wore these and we're going to another one in two more weeks that we plan to bring them to. They fit him perfectly. Another reviewer stated that they were not adjustable. We thought that at first also but found that they are - you just have to work with them. They even fit my adult head comfortably. Peltor Kid Quality Headband Style Ear Muffs (Pink Only) (NRR 22)5aprilJuly 4, 2012these are great! my son didn't even know he was wearing anything! Peltor Kid Quality Headband Style Ear Muffs (Pink Only) (NRR 22)5TimJune 30, 2012Now hear this...!!! Has anyone taken their infant or young baby down in the NYC "dungeons" of a subway?!?!? Or stroll under the tracks (of the subway) outside on the streets??? It's horrendous!!! These "muffs" were ordered just for "NYC Subways"...and we give them "ten stars" instead of five!!! They work for our four "MONTH" young son!!! Nothing else needs to be said, just heard!!! Peltor Kid Quality Headband Style Ear Muffs (Pink Only) (NRR 22)5Christians MommyJune 18, 2012My 6 yr old son has VERY sensitive ears. That being said, the circus, a parade or horror of horrors, fireworks were completely out of the question. I am happy to report that these ear muffs work! They are comfortable and we are now looking forward to the 4th of July! Peltor Kid Quality Headband Style Ear Muffs (Pink Only) (NRR 22)5SueJune 11, 2012Its ok. It did its job but the headphones are small and do not expand to accommodate growth. My son wont be able to wear these again and he is only three. They barely fit him. Peltor Kid Quality Headband Style Ear Muffs (Pink Only) (NRR 22)4DanJune 5, 2012Bought these to take our 5-year-old to music festivals and fireworks this summer. She hates loud noise, what can I say? And I wanted to protect her hearing while rocking out myself, and the Peltor muffs have done the trick. She put them on right away, at home, and when we hit the fest she happily wore them for 2-3 hours with no complaint, enjoying the music without the pain. She has a normal size head, and they fit fine. Peltor Kid Quality Headband Style Ear Muffs (Pink Only) (NRR 22)5DianeMay 16, 2012I love my ear protection. I highly recommend these. They came on time and the sales lady was great. Peltor Kid Quality Headband Style Ear Muffs (Pink Only) (NRR 22)5BeckyMay 8, 2012Getting ready for our first INDY race with the little guy. I wasn't sure what to expect, but as soon as I opened the package I knew they were perfect. We tested them out and they fit perfectly! Peltor Kid Quality Headband Style Ear Muffs (Pink Only) (NRR 22)5sarahMay 1, 2012I bought this item for my infant because we are around loud music 2 days a week. I wasn't sure if they were going to fit, read other reviews to see if they work for an infant. Got them in and they are big for my 5 week old as far as the size of the ear muff part goes (fits his head from very bottom of head to very top) but it will still work and it looks like he will be in them a really long time. The quality of the item seems to be really good as well. Peltor Kid Quality Headband Style Ear Muffs (Pink Only) (NRR 22)5AmberApril 29, 2012My husband drag races, and we wanted to take our 3 month old twins back to the track for the first time. I had another twins racing mom suggest these... WE LOVE THEM! They fit great, and didn't seem too tight. They didn't try to grab at them either. Thank you!!! Peltor Kid Quality Headband Style Ear Muffs (Pink Only) (NRR 22)5Cheryl BApril 29, 2012Bought the blue ones for our 6 month old grandson for a Super Motocross Race. He never once tried to take them off or fussed with them on. What a great product. Peltor Kid Quality Headband Style Ear Muffs (Pink Only) (NRR 22)5SaraApril 16, 2012These fit our 6 month perfect and he cant get them off when pulling on them! I cant wait to use them! Peltor Kid Quality Headband Style Ear Muffs (Pink Only) (NRR 22)5Lori WallaceMarch 30, 2012This product is awesome! I was looking for something small enough for my infant grand baby, and this product went over his tiny ears and was perfect size. Peltor Kid Quality Headband Style Ear Muffs (Pink Only) (NRR 22)5Jennie BurchfieldMarch 13, 2012Great product, wonderful service! Excellent experience! Peltor Kid Quality Headband Style Ear Muffs (Pink Only) (NRR 22)5HeatherMarch 12, 2012I havn't used the muffs yet but am happy to report they fit! My son has a kinda big head so I was concerned they would be too small. The band adjusted and he didn't mind wearing them. They feel quite light and think they are going to work out just fine. Peltor Kid Quality Headband Style Ear Muffs (Pink Only) (NRR 22)5BillMarch 10, 2012Took our kids to Monster Jam and the earmuffs worked perfect. Kids did not complain about noise or being uncomfortable with the earmuffs on. Peltor Kid Quality Headband Style Ear Muffs (Pink Only) (NRR 22)5WESFebruary 23, 2012The students are loving it. I see some that used to wander around during independent working time now focusing on their task. Wonderful! Peltor Kid Quality Headband Style Ear Muffs (Pink Only) (NRR 22)5CrystalJanuary 11, 2012I Love these pink Ear Muffs! I also bought a black pair but after seeing the pink I wish I had waited for the boys Blue to come back in stock! I chose this brand over others because they were made in AMERICA! I think it's important to support and buy American Made any chance you get! They fit both my 4 yr old and my 15 month old with Plenty of room to grow! Peltor Kid Quality Headband Style Ear Muffs (Pink Only) (NRR 22)5LauraDecember 12, 2011I purchased this product for my 3 year old granddaughter. I work all the High School Basketball Games. The noise level with the Pep Band playing, crowd and buzzers was very loud. My granddaughter loves them! I expected a struggle from a 3 year old. She tried them on, lifted them off one time, recognized the noise difference, said Thank You and continued to wear them the entire game. Peltor Kid Quality Headband Style Ear Muffs (Pink Only) (NRR 22)5KatieNovember 9, 2011My 2.5 year old son just loves these! Now he can help his Daddy stack wood, while he's running the wood splitter. He also using them when riding on our tractor. Peltor Kid Quality Headband Style Ear Muffs (Pink Only) (NRR 22)5AmandaOctober 28, 2011These are amazing. I was worried about taking my 3 month old to an airshow but with these on, she literally didnt have a care in the world. Even with that super loud jets doing their thing. I highly reccommend these earmuffs. They were fantastic! Peltor Kid Quality Headband Style Ear Muffs (Pink Only) (NRR 22)5MichelleOctober 26, 2011These worked great! We took our son to a concert (outdoors) and he slept the whole time with these on. I am very glad we purchased these! I would definitely recommend them to others! Peltor Kid Quality Headband Style Ear Muffs (Pink Only) (NRR 22)5TeresaOctober 25, 2011I bought these for my 8 month old twin grandsons because they get very upset at College football games that we go to. They both wore them to homecoming (which is VERY LOUD) and they fell asleep! Great product. Peltor Kid Quality Headband Style Ear Muffs (Pink Only) (NRR 22)4LyndsiOctober 17, 2011I like the ear phones for my eight month old because they are very soft on his head. Peltor Kid Quality Headband Style Ear Muffs (Pink Only) (NRR 22)5sonia chiassonSeptember 20, 2011fonctionne tres bien. je recommenderais le produits a tpous. Peltor Kid Quality Headband Style Ear Muffs (Pink Only) (NRR 22)5Mom of TwoSeptember 10, 2011We bought two pair for our children (6 weeks and 2 years). We took them to the Cleveland Air Show and the baby slept through the whole thing. Our two year old was terrified by the jet noise until she put hers on and then she was fine for the rest of the show. I highly recommend this product. Peltor Kid Quality Headband Style Ear Muffs (Pink Only) (NRR 22)5LizAugust 25, 2011They work great. My son is Autistic and has issues with loud noises. I can now use the vaccum, blender, and other loud noisy appliances without having to worry about my son. He loves the color and says they are so "cool". They seem very comfortable too as he doesn't complain about them hurting him. Peltor Kid Quality Headband Style Ear Muffs (Pink Only) (NRR 22)5KarlaAugust 22, 2011Wow! These arrived so quickly and are exaclty what I'd hoped for. My 18 mo. old loves wearing them around the house and taking them on and off. I was a little concerned because they seem very tight. I have had Peltor's before and they've given me a headache because they fit so snug. However, I think these will be great for him to wear at an upcoming football game, even if just for short bursts of time when it is really loud. Excellent value for the money!!! Peltor Kid Quality Headband Style Ear Muffs (Pink Only) (NRR 22)5DirckAugust 21, 2011Son sleep through the races with the muffs on. Loud cars for 3 hours and not a peep. Great protection. Peltor Kid Quality Headband Style Ear Muffs (Pink Only) (NRR 22)5RyanAugust 16, 2011Ordering was easy. Quality is good. Timely delivery. Reasonably priced. Both my children enjoy wearing them. They even wear them for the fun of it around the house sometimes. Peltor Kid Quality Headband Style Ear Muffs (Pink Only) (NRR 22)5Cathy ThurmanAugust 2, 2011We took our 4 month old grandaughter to the Iowa State Trap Shoot the earmuffs put her in her own world, she heard nothing that concerned her or kept her awake while she was out for short periods of time. While we didn't try long periods I think if would have been the same results. While we were "looked" at with smiles by many everyone we spoke to thought it was a great idea. I told them where we bought them. Peltor Kid Quality Headband Style Ear Muffs (Pink Only) (NRR 22)5FannyJuly 19, 2011I bought one for my 19 months daugther and one for my 3 years old son and they both fit perfectly. We've been to an inside motocross race and everybody enjoyed it. Peltor Kid Quality Headband Style Ear Muffs (Pink Only) (NRR 22)5EveJuly 13, 2011I bought these for my 4 1/2 month old daughter, and they work great she slept right thru the firework show! and they will fit her for a while! Peltor Kid Quality Headband Style Ear Muffs (Pink Only) (NRR 22)5CassandraJuly 12, 2011I bought these for my daughter who has autism. She is sensitive to loud noise/multiple noise sources. When she puts these on, she can still hear me but filter out a lot of the background noise. Peltor Kid Quality Headband Style Ear Muffs (Pink Only) (NRR 22)5SandraJuly 12, 2011My 6yr. old has ADHD and is very sensitive to sound. Brought the kids to Disney. These were great on the loud rides and shows. Both kids, ages 6 and 3 loved putting them on themselves. The sound was lessened and they were still able to hear the shows and enjoy the rides. The 3 yr. old fell a sleep just before one of the stunt and special effect shows. We put the muffs on him and he slept through the whole thing, explosions and all! Looks like these will be coming to the movies with us also! Peltor Kid Quality Headband Style Ear Muffs (Pink Only) (NRR 22)5Judy FitzgeraldJuly 11, 2011I bought these to protect my little ones hearing. I took him to two fireworks shows and he didn't flinch or jump when they were going off. His second fireworks show was very loud and what seemed like multiple finales. He actually fell asleep mid way through the second show. He didn't seem uncomfortable at all. I would highly recommend them. Thank you. Peltor Kid Quality Headband Style Ear Muffs (Pink Only) (NRR 22)5JennyJuly 3, 2011Our little guy went to his first rock concert when he was 2 months old. His daddy is a sound engineer, and was working the show. He approved them for hearing protection, and I liked them because they didn't seem uncomfortable. Yes, it took some time for him to adjust to wearing them, but once he did he was able to sleep through the concert. Also, the ear plug store was great to work with. Peltor Kid Quality Headband Style Ear Muffs (Pink Only) (NRR 22)5MaryLou SJune 27, 2011These earmuffs are AWESOME! I bought 2 sets for my Grandsons to go to the fireworks last Sat. night and not only did the 16 month old love the fireworks but he FELL ASLEEP in the middle of them. He never flinched even during the Grand Finale which was very LOUD! This company is wonderful, the price was very reasonable and their shipping was FAST! 5 stars all the way!! Peltor Kid Quality Headband Style Ear Muffs (Pink Only) (NRR 22)5Nicole CJune 26, 2011We bought these earmuffs prior to taking our son to three days of Chicago sporting events and they were a great investment! Thank you for this awesome product! Peltor Kid Quality Headband Style Ear Muffs (Pink Only) (NRR 22)4Wil E.June 21, 2011My son doesnt mind wearing them and they fit well, and worked great for what we needed them for and the price was reasonable. Peltor Kid Quality Headband Style Ear Muffs (Pink Only) (NRR 22)5AlexJune 16, 2011Great product!! It took my 8 month old a little getting used to, (about 4 days), but once he did it was fine. We went to a Formula 1 race in Montreal and he slept through qualifying and some of the race with them; he wasn't bothered at all. Earplugstore.com is awesome, we received the earmuffs quicker than anticipated and the selection was great. Peltor Kid Quality Headband Style Ear Muffs (Pink Only) (NRR 22)5cmsMay 30, 2011Great earmuffs! They are a bit bulky, but the kids (age 4 and 8months) don't seem to mind. They prefer the earmuffs to the loud music! Peltor Kid Quality Headband Style Ear Muffs (Pink Only) (NRR 22)5EB McCarthyMay 24, 2011My 6 month old son loves his new Kid Peltors. I bought them for him so he wouldn't be freaked out from the loud crowd noises (cheering, yelling, drumming) or the stadium noises (annoucements, songs, etc) at Major League Soccer games. He didn't tug or pull on the earmuffs and he was so calm during the game. He even took a nap on my shoulder (while wearing the Peltors). We even got a few compliments from the stadium staff who were impressed that we were protecting our son's ears from potential damage. Peltor Kid Quality Headband Style Ear Muffs (Pink Only) (NRR 22)5ErinMay 23, 2011Bought for my 7 week old son for when we go riding (quads, rhinos & dirtbikes). Went shooting yesterday and decided to test em out, had a variety of guns, and my son never even flinched. In fact, he slept majority of the time. Will definitely recommend to friends! Peltor Kid Quality Headband Style Ear Muffs (Pink Only) (NRR 22)5RandyMay 19, 2011bought these for my grandson for when he goes watch his father race motorcycles and when riding the lawn tractor. He loves them and wants to wear them all the time. Peltor Kid Quality Headband Style Ear Muffs (Pink Only) (NRR 22)5kayla overtonMay 19, 2011these were amazing at the drag races!! i do pin up and every mothers day there are vintage races. Last year we had to leave early because we had no ear protection for my daughter. This year she wore them ALL day and Loved the Races!!! great product!! Peltor Kid Quality Headband Style Ear Muffs (Pink Only) (NRR 22)5MichelleMay 17, 2011Bought these for my niece who is just a little over 9 weeks old. Love them. My brother races dirt track cars and she wasn't phased at all by the loud cars. Received the shipment in perfect condition. Peltor Kid Quality Headband Style Ear Muffs (Pink Only) (NRR 22)5PhillipMay 9, 2011I have two kids, both have been using these since they were infants, and both LOVE them. They work so well and really hold up nice over time. Great price, great buy! Peltor Kid Quality Headband Style Ear Muffs (Pink Only) (NRR 22)5CherylMay 2, 2011I purchased these earmuffs for my 15 month to go to his first Nascar race. They are great and I will definintely recommend them. The service that I received at earplugsuperstore.com was also great. Thanks to the great earmuffs my son enjoyed his first race at Richmond. Peltor Kid Quality Headband Style Ear Muffs (Pink Only) (NRR 22)5AshleyApril 27, 2011I purchased these ear muffs for my 5 month old lil boy because his uncle is a race car driver at a local track in WI and we go to the races every weekend. My lil boy was able to sleep through the whole races without waking up! I am so impressed with this product and have recommended to several people. Peltor Kid Quality Headband Style Ear Muffs (Pink Only) (NRR 22)5JasonApril 25, 2011Bought two pair for my kids to wear at the grand prix. My 6 year old and 8 year old wore them most of the time we were there and never complained about the noise or having to wear them. I also bought the belt clip accesory and it worked perfect for when they were not on their heads. Really Happy!!! Peltor Kid Quality Headband Style Ear Muffs (Pink Only) (NRR 22)5ElayneApril 9, 2011Have 2 pair of these for my 6 year old son who has a seizure disorder that can be triggered by loud noises. We keep one at home for church services and thunderstorms and one at school for assemblies and firedrills. They work great! He goes to get them himself if things get too loud for him. Peltor Kid Quality Headband Style Ear Muffs (Pink Only) (NRR 22)5KellyApril 7, 2011I have 2 pair of these one for my 3 1/2 yr old boy and I just ordered another pair for my 10 month old girl. We are tractor pullers and these earmuffs work great for tractors but especially for trucks and modifieds. They protect their ears during the pulls and let them sleep peacefully when they are worn out. Thanks so much. Peltor Kid Quality Headband Style Ear Muffs (Pink Only) (NRR 22)4s.fahsApril 6, 2011great product. a must for concerts, wedding, and sporting events. too cute. lots of complements on the hot pink muffs. Peltor Kid Quality Headband Style Ear Muffs (Pink Only) (NRR 22)5BrandyeApril 4, 2011My two year-old daughter wore these earmuffs to an air show last weekend and was even able to take a nap during the show. The ear muffs are definitely kid-sized and were a perfect fit for her. Peltor Kid Quality Headband Style Ear Muffs (Pink Only) (NRR 22)5melissaApril 1, 2011Just got these for my 4 wk old son so we can take him to the ice hockey games. he didn't mind wearing them at all and didn't even flinch at the loud sounds! Peltor Kid Quality Headband Style Ear Muffs (Pink Only) (NRR 22)5DarcieMarch 30, 2011We bought the hot pink ones for my 8 month old daughter. My husband LOVES to go to outdoor concerts - we live in the "Live-Music Capitol of the World". So, with Austin City Limits and SXSW concert series, along with all the other live music venues here, we wanted to be able to still go, but have our baby's hearing protected. I heard about them through a friend who's husband rides in the rodeo. They used them for their daughter and she was able to sleep through all the crazy noise of it all. I ordered them on a Tuesday and they arrived Friday, just in time for a concert that night! They worked perfectly for our daughter, fit wonderfully, and I HIGHLY recommend them to anyone! Peltor Kid Quality Headband Style Ear Muffs (Pink Only) (NRR 22)5Sanford TyndaleMarch 22, 2011Just bought my second pair for my Autistic grandaughter. These help her to attend many events that she would run out of because of the loud noises before she got tem. We keep one set and her parents have the other. This way we can take heer places and not worry that she will get spooked. Peltor Kid Quality Headband Style Ear Muffs (Pink Only) (NRR 22)5BrendaMarch 17, 2011Perfect! My son does not like loud noises. We are attending an Air Show soon and these will help him. He put them on and we turned the stereo on exceeding loud. No reaction; I have sensitive ears too and tried them out. I bought adult sets for my husband and I.
Peltor Kid Quality Headband Style Ear Muffs (Pink Only) (NRR 22)5KacieMarch 14, 2011Bought them for my grandchild. Peltor Kid Quality Headband Style Ear Muffs (Pink Only) (NRR 22)5Linda SpallinaMarch 6, 2011I would recommended these to everyone! My husband and I brought my 5 month old son to his first hockey game and wanted to protect his hearing. Not only did my son wear them the entire game but He also fell asleep with them on during the game. Peltor Kid Quality Headband Style Ear Muffs (Pink Only) (NRR 22)5MandyMarch 2, 2011I bought these for my 2 year old son for the monster truck show and they fit perfect and they did their job! Couldnt ask for anything better! Peltor Kid Quality Headband Style Ear Muffs (Pink Only) (NRR 22)5BrittanyFebruary 28, 2011We bought these earmuffs for our daughter because my husband is a pilot. We thought that she would hate them on her head as she is only 8 months, but she actually didn't mind them. We will be purchasing more for out neices and nephew so that can enjoy flying with us as well. Peltor Kid Quality Headband Style Ear Muffs (Pink Only) (NRR 22)5TriciaFebruary 15, 2011My son loves these! I have also recommended this site to his teacher so they can notify other parents of this company. Peltor Kid Quality Headband Style Ear Muffs (Pink Only) (NRR 22)5KariFebruary 7, 2011I ordered this earmuffs for my 3 1/2 year old son for the monster truck show we went to this past weekend. Boy was I happy I ordered them. The arena was too loud for me so I can image how loud it was for him. He kept them on the entire show and enjoyed every minute of it. A father behind me asked about the earmuffs for his child and was hoping they sold them in the arena. Sorry, they didn't. Better planning next time. He actually left the show because it was too loud. Peltor Kid Quality Headband Style Ear Muffs (Pink Only) (NRR 22)5SaraFebruary 2, 2011I bought these for my 21 month old son before going to a monster truck show. They worked great keeping the sound out. He hates hats or anything on his head but these were so comfortable, he kept them on during the whole show! Highly recommend them! Peltor Kid Quality Headband Style Ear Muffs (Pink Only) (NRR 22)5LindsayJanuary 31, 2011I used them this past weekend for my 2 1/2 year old son at Monster Jam. He loved them, they fit great, and they even fit me. (Mom) I'm looking forward to using them for both of us in the years to come. Peltor Kid Quality Headband Style Ear Muffs (Pink Only) (NRR 22)5SarahJanuary 31, 2011I purchased these pink earmuffs for my 2 1/2 year old daughter. She loves them!!! Great product!!! Peltor Kid Quality Headband Style Ear Muffs (Pink Only) (NRR 22)5ConnieJanuary 18, 2011Bought these for my grandson to be able to watch his Uncle tractor pull. They worked great. Thank you for a great product. Peltor Kid Quality Headband Style Ear Muffs (Pink Only) (NRR 22)5JoshlyJanuary 17, 2011I purchased this for a 1 year old who's father is an audio engineer. Her ears will be fully protected at the next concert! Peltor Kid Quality Headband Style Ear Muffs (Pink Only) (NRR 22)5BillJanuary 1, 2011Great product grandson was having problems with being afraid of loud noises outside. He took to the earmuffs right away. They work and have life much easier with the 3yr old. Peltor Kid Quality Headband Style Ear Muffs (Pink Only) (NRR 22)5JenniferDecember 23, 2010Took my 2 year old and 6 month old to a UK basketball game. My youngest slept half the time. None of the loud noises (which included fireworks) bothered them. We'll be using them again when we go to Chicago for a hockey game. Peltor Kid Quality Headband Style Ear Muffs (Pink Only) (NRR 22)5karen marcinkoDecember 12, 2010Loved this product. I bought them for my 7 month old grandson. The whole family was going to Cirque de soleil and we wanted to take him. Concerned about the loud noises, I purchased these earmuff. The first hour he slept, the second he watched the entire show. We probably couldn't have watched the show without them. His mom thinks their the greatest! Peltor Kid Quality Headband Style Ear Muffs (Pink Only) (NRR 22)5virginiaDecember 11, 2010Our 18 month old granddaughter loves them so far but we will see when we actually go to an event next month and its loud. Peltor Kid Quality Headband Style Ear Muffs (Pink Only) (NRR 22)5ParrasDecember 7, 2010We used this product at an NFL game and they worked very well. You could still hear the game but not as loud. It does muffle all the loud noises which is great for kids. Definitely recommend. Peltor Kid Quality Headband Style Ear Muffs (Pink Only) (NRR 22)5Amy LaMereNovember 30, 2010My 8 month old rockstar twins will not only be stylish but protected! I've had a pair for my 4 year-old, he loves to wear them to vacuum or at the movie theater.